Good Friday to you, folks! In case anyone is wondering, it’s snowing again! I think there’s a trainee in charge of Spring this year who must have misread the job description! Brief Synopsis: Sadie and her dad are going to the zoo. Their plans have been thwarted three previous times, but this time they’re really going. Except… on the way… it starts to rain. They can’t go to the zoo in the rain. But Sadie’s not about to let the fact that her dad sees rain deter her. “I look out my window, and the sun is shining on my side of the car. People are putting on their sunglasses and heading to zoos all over the world on my side of the car.” While her dad sees nothing but rain, Sadie sees people mowing their laws and eating ice cream. Is it raining or not? Will Sadie and her dad get to the zoo this time or will they have to wait for another day? Susanna, now I’m hooked. I have to find this book to see if they make it to the zoo. Good luck with the sun and daffodils on your side of the car! Safe travels. Safe travels Susanna! No snow here yet, but thanks for the heads up about upstate – we’re driving north today. Whatever are we thinking! Here’s hoping for snowdrops, not snowflakes, on all sides of the car. What a clever idea for a book! Love the theme. Have a safe trip to NYC. What fun timing. I am presenting a rain themed story time at my library next week. I just checked this book out yesterday, but haven’t read it yet. Now I’m really looking forward to it. I’m rather fond of your PPBF pick too! Greetings from snowing-one-more-time Colorado! Oh, I like this. One should never underestimate the dogged, determined imagination of a kid. We had some snow earlier in the week…and tornado like winds the other night. But I guarantee that warmer weather is coming, Susanna! 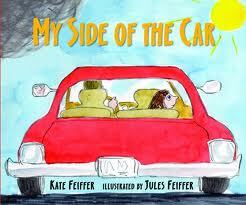 What a fun book…I remember traveling as a kid…my sister ALWAYS saw the rain and I ALWAYS saw the sunshine. Sorry you have to hike to the city…hope you have smooth travels. I love this story by Kate. I’m “sort of” fondly remembering my childhood days when my sister and I thought of the backseat of the family car as your side and my side. And yes, the view we both saw looked quite different. I, of course, must find out if they make it to the zoo because I know if they don’t the ending will still delight me. Thanks, Susanna! This is one of my favorites! I love Jules Feiffer illustrations. (I think the Feiffers are from Wisconsin!) Looks like a great read; at first look I’m reminded of the time that my sister and I were fighting in the third seat row of our station wagon and Dad threatened to put us out and make us walk if we didn’t stop fighting. We didn’t, and he did! We had to walk alongside of the car for the next stretch. Be safe on the road!